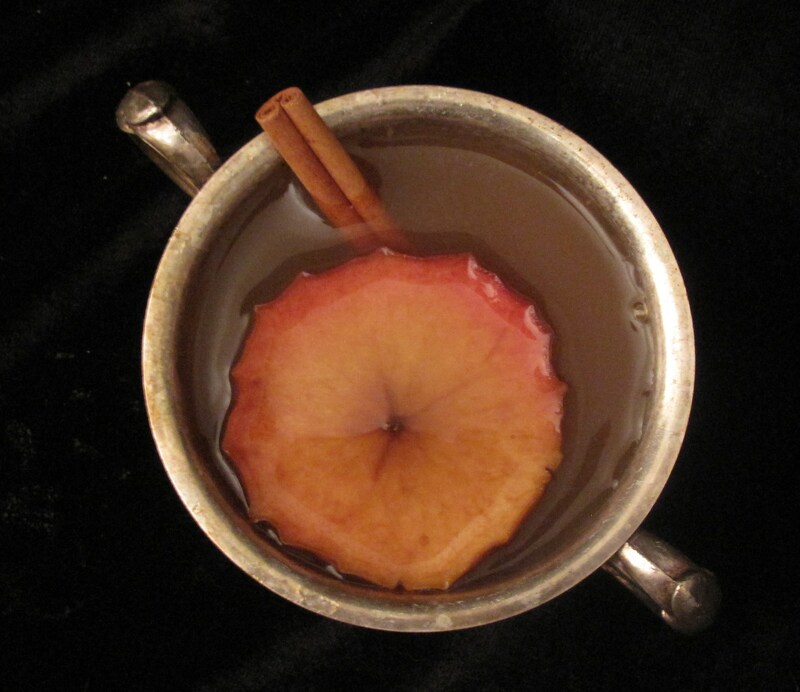 I struggled to find a wassail recipe that really appealed to me, so naturally, I made one up. The resulting beverage is cider perfected. It tastes of autumn, crisp winds, and the Wolfswood. The alcohol combination manages to disappear completely into the cider (danger! danger! ), although the ale gives just the slightest fizz. It starts out subtle, then builds almost instantly to a spiced cider explosion. I’ve heard of adding tea to wassail, and look forward to experimenting with that, but in the meantime, this is a new winter staple at The Inn. Cook’s Notes: The ale we used comes as part of a tasty Smuttynose 12 pack; the Star Island Single is not a popular beer in our house, so is perfect to mix into something else. If you like, you can double the level of alcohol, and not compromise the wonderful way the flavors all meld together. Also, for an interesting varietal, try filling a tea-strainer ball with thyme, and swirl it in each mug. This produces a slightly more medicinal flavor, but in a very good way. Combine all ingredients, float the apple slices in it, and warm gently, keeping below a simmer for around 30 minutes. When it’s steaming, it’s ready to serve. is the cider suppposed to be “real” hard cider – like Strongbow or similar bitter/sour, or one of the sweet types? Good Question! We used the non-alcoholic fruity cider as a base. Wishing you both a New Year filled with blessings! Sounds like it would pack a punch while warming you up. :) Congratulations on another winner. Mmmmmm. I think i’ll try a nip of this with my homemade hard cider as a substitute. Sounds wonderful! I didn’t know where else to say this, but I heard a friend of yours was sick. Just so you know, some of us posters at TOTH wish him love and light, and are keeping him in our prayers. Another variation could use Barenfang or as it’s known in America, Barenjager. It’s a honey liquor that is hot apple cider’s best friend. For those localish to Boston, Nashoba Vineyards out in Bolton MA has a delicious Barenfang. Their Northern Comfort Cognac is also not to be missed! DELICIOUS! We doubled the alcohol, still can’t taste it… Sure can feel it though. This sounds divine! I love mulled cider and this sounds like a more complex (in flavor) version of that; I’ll definitely be making this soon. I continue to be impressed and inspired by your creativity. Looking forward to your cookbook (and of course season 2 of Game of Thrones) in 2012. You know, I’m not quite sure. It does make a lot, so I’d say that 10 people could each have a mug or two. As a previous commenter posted (and yes, we’ve verified), the alcohol is still pretty much hidden even if you double it. Tried it this Xmas and it was fantastic. A bit dangerous perhaps as it doesn’t taste like anything more than hot apple cider. I have (on previous occasions) quadrupled the alcohol content and at that point could taste it a little. It’s powerful and wonderful stuff!